It’s so beautiful outside today that I am insanely jealous of all those I have seen out running whilst I am sat at my desk. Does anyone else get this? So to take away some of the “but we only get 5 sunny days a year and I’m stuck in work” blues , I bring you the first very special race report – mainly because it is written by someone else! 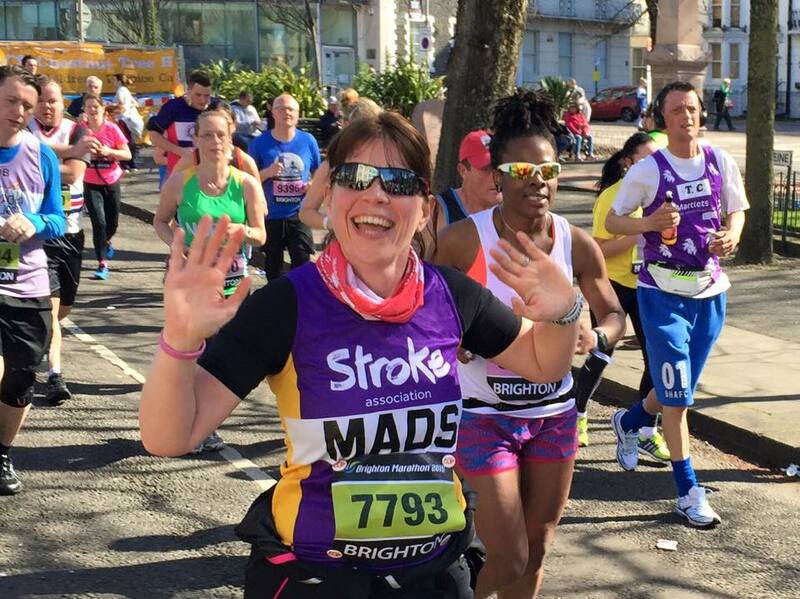 This is the first of two race reports written by those who actually ran Brighton Marathon! Madeleine on her way to a great PB! My first marathon was London 2014, a long 6:02:31 on a hot and sunny day. I loved it and didn’t want to stop at the end! 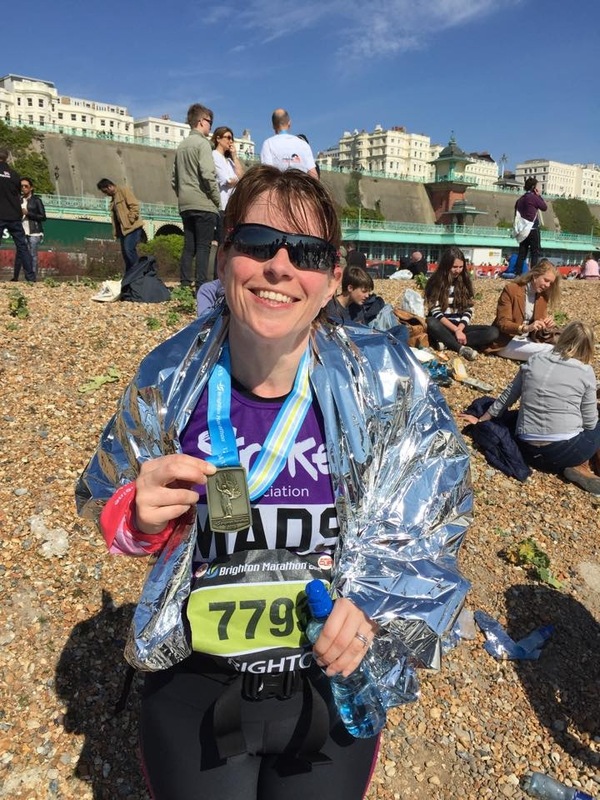 The next night was the SJ marathon party, a small glass of wine went straight to my head and by the end of the night Monica and I had agreed to enter Brighton Marathon 2015! Along with great advice from fellow SJ friends I found a training plan for a 10k that really suited me. Inspired by this I followed the marathon plan from the same source. It followed a ‘less is more’ approach with speed work thrown in to mix it up. I loved the plan and the lovely Sarah Jones accompanied and encouraged me on quite a few cold, dark runs. I stuck to my schedule and a nice little PB at Fleet half marathon spurred me on. Marathon day approached with all the pre race nerves. I felt well prepared and booked a room in Brighton the night before to take some stress out of getting there on time. What I forgot about was the number of stag and hen parties on a Saturday night! I think I managed about 4 hours sleep max! Race day arrived, I had my normal homemade granola with almond milk and banana and set off for the start. I found Gemma straight away and we compared nerves and hopes for the day. The queues for the loo were long and slow and we just made it to the start with minutes to go. A bright sunny day with a chilly sea breeze was perfect! A great way to enjoy the beautiful scenery. The race started in a loop around the park where we had started, including a cheeky incline at the start. We weaved our way around the city for a while and I caught sight of Richard Boese and Monica, always nice to see a friendly face. My favourite part was out to the east of Brighton. It was undulating but quiet and peaceful away from the crowds, all I could hear was the rhythmic footfall of fellow runners, the birds singing and waves crashing on the beach. I was in heaven. Another sighting of the ever smiley Monica accompanied by Vicky Horne. We returned back down to the pier and onto the second half, now the work started. I was really pleased to keep a steady pace up to mile 21. I saw Pam Moscrop, Richard Boese and Emma Lewis, all looking relaxed and focussed. Miles 12 to 18 were well supported by spectators and then it thinned out. I had a tough section from mile 21 to 23, there was a very cold headwind and limited support out in a more industrial part of town. It was a bit fishy smelling too but I focussed on getting to the turning point. From there I knew it was the final straight. Back to seafront and ‘just’ 3 miles to go, I could see the pier, the sun was shining and the crowds just brilliant. I took note of my favourite comments from spectators so I could use them to support London marathon runners in 2 weeks time. The last 2 miles hurt but I kept in mind a sign I had seen “pain in temporary, pride is forever”. I calculated that I would be sub 5 hours so I gave it all I had. I crossed the line in 4:49:11 and had a little cry before getting my medal, a lovely girl hung it around my neck and I could have hugged her (bet she is pleased I didn’t!) Space blanket, banana, finishers t-shirt, found my long suffering hubby and collapsed on the beach with my legs in the air. I’d done it. A great day out, I spent the last 2 miles thinking never again but am already thinking about one next year… Why not?! Since I did Brighton back in 2011 (which I *loved*) I’ve wondered…is the bit to the east of the town *really* nicer than the bit to the west…or is it just easier to feel good in the early miles? Look at London, those who have done it- could you honestly say that Rotherhithe is nicer than the Embankment? It feels like it to me. So how would it feel if they swapped the two halves of marathons around? It’s a fair point. I rarely remember the early miles of any race and I can never recall seeing Big Ben during the bupa 10k – although I am pretty sure they don’t move it for the day!